Parking in crowded city areas usually causes serious problems. Drivers spend an amount of time, effort, and fuel while finding someplace to park their vehicles. Although there are many solutions for free parking space indication; they are only suitable for parking lots inside the buildings, such as the shopping malls. However, there are not many solutions for exterior parking lots and for big cities as a whole. The purpose of this paper is to propose solutions to this problem, especially by considering issues like power consumption and communication approaches. A parking-space occupancy detection system is proposed, utilizing Bluetooth Low Energy communication and Arduino-based sensor devices. Raspberry Pi-based central devices redirect the collected data to the cloud-based database system, which makes them available for drivers to use mobile devices with Android systems. The selected components make the proposed system easily deployable and scalable. “Passenger Cars in the EU,” http://ec.europa.eu/eurostat/statistics-explained/index.php?title=Passenger_cars_in_the_EU#Overview, 2016. “Parking Lots Guiding System,” http://www.tenetparking.com/parking.php?CateId=6, 2017. J. Gubbi, R. Buyya, S. Marusic, and M. Palaniswami, “Internet of Things (IoT): A vision, architectural elements, and future directions,” Future Generation Computer Systems, vol. 29, no. 7, pp. 1645-1660, Jan. 2013. “Raspberry Pi: A Small and Affordable Computer that You Can Use to Learn Programming,” https://www.raspberrypi.org/, 2017.
nRF8001 Preliminary Product Specification-Bluetooth Low Energy, Nordic Semiconductor, 2011. Q. Wu and Y. Zhang, “Parking lots space detection,” Machine Learning, Fall, 2006. R. Yusnita, F. Norbaya, and N. Basharuddin, “Intelligent parking space detection system based on image processing,” International Journal of Innovation, Management and Technology, vol. 3, no. 3, pp. 232-235, June 2012. H. R. H. Al-Absi, J. D. D. Devaraj, P. Sebastian, and Yap Vooi Voon, “Vision-based automated parking system,” 10th International Conference on Information Science, Signal Processing and their Applications (ISSPA 2010), IEEE, October 2010, pp. 757-760. R. Grodi, D. B. Rawat, and F. Rios-Gutierrez, “Smart parking: Parking occupancy monitoring and visualization system for smart cities,” in SoutheastCon, IEEE, July 2016, pp. 1-5. A. Khanna and R. Anand, “IoT based smart parking system,” 2016 International Conference on Internet of Things and Applications (IOTA), IEEE, September 2016, pp. 266-270. SENSIT: Wireless Vehicle Detection Sensors, Nedap Identification Systems, 2008. C. Lee, Y. Han, S. Jeon, D. Seo, and I. Jung, “Smart parking system for Internet of Things,” 2016 IEEE International Conference on Consumer Electronics (ICCE), IEEE, March 2016, pp. 263-264. T. N. Pham, M. F. Tsai, D. B. Nguyen, C. R. Dow, and D. J. Deng, “A cloud-based smart-parking system based on Internet-of-Things technologies,” IEEE Access, vol. 3, pp. 1581-1591, September 2015. “Community-Based Parking: Helping One Another Find the Nearest Available Parking Space More Quickly,” http://www.bosch-mobility-solutions.com/en/highlights/connected-mobility/community-based-parking/, 2017. S. Nagmote, P. Mane, S. Musle, and S. Sarwade, “A proposed automated car parking system based on Android,” International Journal of Application or Innovation in Engineering & Management (IJAIEM), vol. 4, no. 3, pp. 311-313, March 2015. 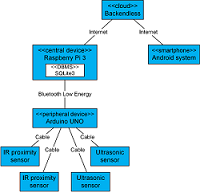 Y. R. Dhumal, H. A. Waghmare, A. S. Tole, and S. R. Shilimkar, “Android based smart car parking system,” International Journal of Advanced Research in Electrical, Electronics and Instrumentation Engineering, vol. 5, no. 3, pp. 1371-1374, March 2016. Renuka R. and S. Dhanalakshmi, “Android based smart parking system using slot allocation & reservations,” ARPN Journal of Engineering and Applied Sciences, vol. 10, no. 7, pp. 3116-3120, April 2015. C. Gomez, J. Oller, and J. Paradells, “Overview and evaluation of Bluetooth low energy: An emerging low-power wireless technology,” Sensors, vol. 12, no. 9, pp. 11734-11753, August 2012.